1667 ~ 1685: born in Edo in une family related to the Morita clan. He makes his first appearance on stage at an unknown date and receives the name of Bandô Matatarô I. 1685: Matatarô plays together with his grandfather Bandô Matakurô I at the Moritaza in the drama "Usuyuki Monogatari". Spring 1693: Matatarô goes to Kyôto. 7th lunar month of 1696: Matatarô plays at the Moritaza the role of Ôe no Teruhide in the drama "Heishinnô Masakado". 2nd lunar month of 1697: Matatarô plays at the Moritaza the role of the Deity Fudô Myôô in the drama "Iwaya Fudô". 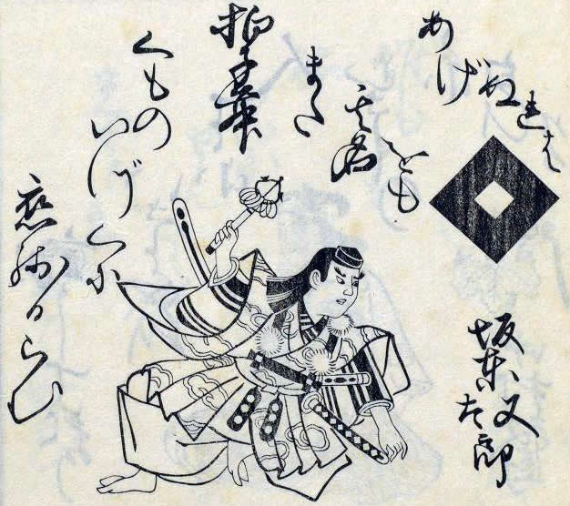 Summer 1698: short stay in Kamigata; Matatarô plays the role of Ôe no Teruhide in the drama "Yûjo Tsuya Oshiroi", which is produced in Ôsaka by the zamoto Iwai Hanshirô I. 11th lunar month of 1698: Matatarô is back in Edo; he plays the role of Aranami Heita in the drama "Genji Daikoku Bashira", which is staged at the Yamamuraza. 11th lunar month of 1699: Matatarô plays at the Ichimuraza the role of Ishiyama Genta in the drama "Hankaichô Tsuwamono Zoroe". 11th lunar month of 1702: Matatarô plays at the Yamamuraza the role of Kamakura Gongorô Kagemasa in the kaomise drama "Yunzei Otokoyama Hachiman Tarô". 1st lunar month of 1703: Matatarô plays in the same theater the role of Soga Gorô Tokimune in the drama "Keisei Asama Soga"; the role of Soga Jûrô Sukenari is played by Nakamura Shichisaburô I. Spring 1704: Matatarô appears on stage for the last time, playing the roles of Shibuya Shôji and Zen'ômaru in the drama "Genji Aioi Jûnidan", which is staged at the Yamamuraza. 28th day of the 2nd lunar month of 1704 : Matatarô dies in Edo. Bandô Matatarô I was a talented and popular Genroku actor, able to play both tachiyaku and onnagata roles. He excelled in jitsugotoshi, aragotoshi and budôgoto roles. He was also an outstanding dancer. The 28th day of the 2nd lunar month of the 17th year of the Genroku era was the 2nd of April 1704 in the western calendar.